Every home buyer and real estate agent knows that Bay Area home prices have dropped, inventory is way up, and sellers are willing to deal. In the same time different people have different notions of what cheap means. 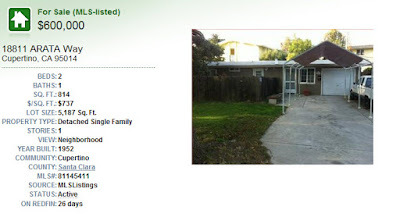 Today the cheapest home in Cupertino school district costs $600,000, has 2 bedrooms and 1 bath on 814 square feet, and build in 1952. It sounds like the potential home buyer will pay not for home located on 18811 Arata way in Cupertino, but for land in attendance area of Cupertino and Fremont Union High School District.